From the "Treasures of Byzantium: 330-1453" exhibit at the Royal Academy of the Arts. Via 24-hour Museum. The artifact is on loan from Procuratoria di San Marco, Venice. EXTREMELY rare fragments of Anglo Saxon embroidery from Worcester, nearly 1,000 years old and hidden away for decades, are currently being painstakingly restored and conserved by specialists. The exquisite fragments are the only surviving pieces from the same period as the famous Bayeux Tapestry in France and are among the very earliest examples of English embroidery. And tantalising too, is the real possibility that they may have been part of vestments which belonged to St Wulfstan, Bishop of Worcester from 1062 until 1095. The 1,000th anniversary of his birth is being celebrated this year. Reading stones were said to be invented by Abbas Ibn Firnas, in 8th century Córdoba, Spain, who had devised a way to finish sand into glass; which until this time, was secret to the Egyptians. These glasses could be shaped and polished into stones used for viewing - known as reading stones. These spread to the rest of Europe from approximately the 11th century onwards. The function of reading stones was replaced by the use of spectacles from the late 13th century onwards. A fourteenth-century depiction of Joseph of Arimathea collecting the blood of Christ in the grail cup, from the BBC Legend of the Holy Grail Gallery. In response to Jake's question about the grail: The legend places the filling of the grail at the crucifixion, not the interment. It is believed that Giotto painted this nativity (c. 1305) with the 1301 appearance of Halley's comet in mind. I don't think he had ever seen a camel though. Scribal points to iamnot for identifying this fifteenth century tool as a set of dental pliers. The photo comes from the Institut für Realienkunde des Mittelalters und der frühen Neuzeit via the Medieval and Renaissance Material Culture website. (Although in a pinch, you could probably pinch witches with it . . .). Here's an illustration of a medieval "dentist" (probably a barber) pulling a tooth with a set of dental pliers (looks like a different design from the featured item). My guess is that the rope with the teeth in it is attached to the pliers -- sort of like a pair of glasses on a necklace -- and went around the tooth-puller's neck to advertise his trade. The scene is set in the letter D for dentes (teeth) and comes from a fourteenth-century encyclopedia called Omne Bonum (all good things). According to Lucy Freeman Sandler, The Omne Bonum was "a unique illustrated encyclopedia composed in London between 1360 and 1375 by James le Palmer, Treasurer’s Scribe in the Exchequer." The compilation of encyclopaedias is one of the most important developments in European cultural history. 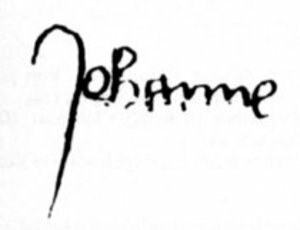 The Omne Bonum of James le Palmer not only stands at a major turning point in the development of this phenomenon but is one of the great untapped resources for the study of the fourteenth century. No one had created an alphabetical list of subjects of this size before James compiled what he called his “Every good thing” . . .
Scott Nokes of Unlocked Wordhoard characterizes the process in a nutshell: "Imagine knitting with a die, hammer, and shears." The photo is a detail of the Bayeux haubert. The resolution isn't that great, but I wanted to show the interlocking links. Bishops and their officials must labor with all their strength to uproot thoroughly from their parishes the pernicious art of sorcery and malefice invented by the devil, and if they find a man or woman follower of this wickedness to eject them foully disgraced from the parishes. For the Apostle says, "A man that is a heretic after the first and second admonition avoid." Those are held captive by the Devil who, leaving their creator, seek the aid of the Devil. And so Holy Church must be cleansed of this pest. "It is also not to be omitted that some unconstrained women, perverted by Satan, seduced by illusions and phantasms of demons, believe and openly profess that, in the dead of night, they ride upon certain beasts with the pagan goddess Diana, with a countless horde of women, and in the silence of the dead of the night to fly over vast tracts of country, and to obey her commands as their mistress, and to be summoned to her service on other nights. "But it were well if they alone perished in their infidelity and did not draw so many others into the pit of their faithlessness. For an innumberable multitude, deceived by this false opinion, believe this to be true and, so believing, wander from the right faith and relapse into pagan errors when they think that there is any divinity or power except the one God. "Wherefore the priests throughout their churches should preach with all insistence to the people that they may know this to be in every way false, and that such phantasms are sent by the devil who deludes them in dreams. Thus Satan himself, who transforms himself into an angel of light, when he has captured the mind of a miserable woman and has subjected her to himself by infidelity and incredulity, immediately changes himself into the likeness of different personages and deluding the mind which he holds captive and exhibiting things, both joyful and sorrowful, and persons, both known and unknown, and leads her faithless mind through devious ways. And while the spirit alone endures this, she thinks these things happen not in the spirit but in the body. "Who is there that is not led out of himself in dreams and nocturnal visions, and sees much sleeping that he had never seen waking? "Who is so stupid and foolish as to think that all these things that are done in the spirit are done in the body, when the Prophet Ezekiel saw visions of God in spirit and not in body, and the Apostle John saw and heard the mysteries of the Apocalypse in spirit and not in body, as he himself says "I was rapt in Spirit". And Paul does not dare to say that he was rapt in his body. "It is therefore to be publically proclaimed to all that whoever believes in such things, or similar things, loses the Faith, and he who has not the right faith of God is not of God, but of him in whom he believes, that is the devil. For of our Lord it is written, "All things were made by Him." Whoever therefore believes that anything can be made, or that any creature can be changed to better or worse, or transformed into another species or likeness, except by God Himself who made everything and through whom all things were made, is beyond a doubt an infidel." The woodcut I used to illustrate this article is from the Cornell Witchcraft Collection: Ulrich Molitor's De Lamiis et Phitonicis Mulieribus [About Demons and Witches], 1493. It's much more of a "Renaissance" image than a medieval one. It was not until the publication of the Malleus Maleficarum in 1487 that witch fever really took hold of the educated European imagination. Previously, educated people thought that witches were deluded people who thought they could perform magic, but by the 16th century magic seemed to be a matter of substance rather than simply illusion.